After a wonderful couple of days recording and mixing at Belfry Studio, I really felt a need to get out in the garden and get my hands dirty today. I wanted to get some space before listening to the CD again. Hobart turned on a fabulous spring day for me and I had a great time. Lots of playing with the rabbits, who had their hutches cleaned out and then planting sunflower seedlings and climbing beans, mulch courtesy of the rabbits. It was a perfect day for cutting Tarragon for drying too. All the time I kept thinking about the recording, even sang a few bars to the chooks, who didn’t mind at all – they had silverbeet and kale leaves to peck at. As I was finishing up for the day, I noticed some garlic at the front of a bed. 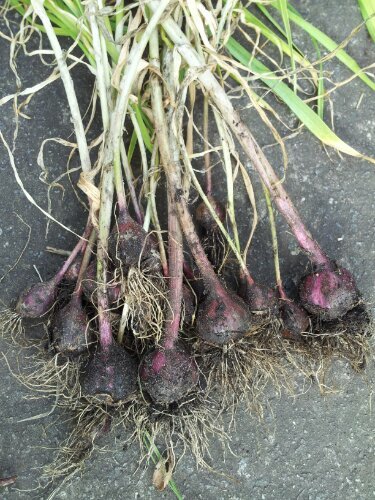 Now, I have garlic everywhere in my garden, I love it and can never grow enough but it tends to get overlooked as it dies down. I realised these were cloves I forgot to pull last summer. So tonight’s stir fry had fresh garlic – and I have about a dozen or more heads to cure and plait for keeping. After dinner, I sat back and put the CD on – yes, there’s minor tweaks that I need to make but wow – I’m very pleased and proud.